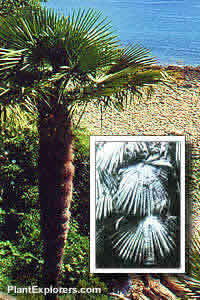 This palm is one of only two or three species hardy enough to grow in VanDusen Gardens, without any special winter protection, in the far south-western corner of Canada. These palms have been growing here long enough to have grown their second and third generations. This single-stemmed evergreen palm has fan-shaped green leaves up to 30 inches long. In gardens, reaches a height of 30 feet with an 8 foot spread. Seed is stored in moist peat moss to maintain maximum viability. Seed may begin germination while still subjected to refrigeration, in which case seeds should be planted immediately, but handle them carefully to avoid breaking the new roots. For maximum freshness, please keep seed refrigerated in its original packaging until it is time to plant. Sow the large seeds individually into pots of sterile growing medium and germinate at 15ºC (60ºF) then grow on at slightly warmer temperatures. Seeds and seedlings of all species of palms are very sensitive to attack by fungus gnats, so precautions should be taken to prevent an infestation. Seedlings may be planted out when they are two-years old or more, and grown on in semi-shade in any good garden soil with good drainage. As the plants mature they will be able to tolerate greater exposure to sun.